The answer is not simple. It’s practically impossible to make a traditional remaster of the original Naughty Dog games. They’re roughly 20 years old, and technology has advanced significantly in that time. The original code and assets are nearly unusable. Nearly. But we don’t consider this a remake. We know how much you all love the original games, so we didn’t want to fully remake them. The N. Sane Trilogy is a remaster plus. The first step in our remaster plus was to truly understand what made the Naughty Dog games special and why fans still love them to this day. The best way to understand a game is to play it, and boy, did we play the Crash games. We played them to the point that we broke controllers from mashing the jump button too much. We studied original concept art and commercials for inspiration. And we went even further back to understand the material that originally inspired Naughty Dog, including Who Framed Roger Rabbit? and Looney Tunes. With all of that in mind, we started our work. Using the original level geometry from Naughty Dog as a guide, we rebuilt the Crash gameplay from scratch, capturing its simplicity and precision. As the levels began to take shape, we layered in our own lush and zany art, animation, and audio. Because this is a remaster plus, we have an opportunity to add features. Choosing new features is a difficult process. We consider numerous things, including the team’s ideas and fan requests, but perhaps our most important consideration is the evolution of the franchise itself. Naughty Dog learned a lot of lessons on how to refine the Crash formula over the course of making three games. So, the first new features we’ve worked on take the best of each of the games and apply them to all three. *Time Trials in all three games! These aren’t the only new features for the N. Sane Trilogy. However, that’s all we’re going to share for today. Seriously, though, there’s no time for more. We have to get back to work making the game. (Naughty Dog packed so much gameplay into those original PlayStation CDs!) We hope you enjoyed this taste of the Crash Bandicoot N. Sane Trilogy, and we’re excited to share more with you soon! Looks utterly hideous, is that running on a PS2? Activision's output has been really ugly this generation. Art style looks odd to me, but this will really depend on what it feels like to play. If Crash is too glidy, too slow...you'll know it straight away. It's like when they brought out the first PS2 game you could just tell the feel of it had changed slightly. The screens actually looks a lot better though. we don’t consider this a remake. We know how much you all love the original games, so we didn’t want to fully remake them. The N. Sane Trilogy is a remaster plus. You've got to applaud the industry's Sisyphean effort to create new buzzwords for the same thing as soon as one becomes untenable/unpopular. Never pre-order or pre-purchase a console, game or season pass. 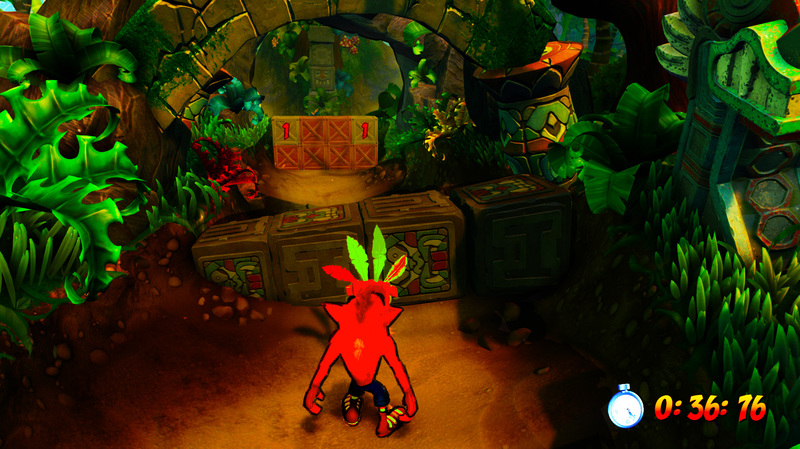 I don't mind the art style, definitely better than most of what we've seen of Crash over the years and although the graphics are simplistic I think they look pretty good. I'm a big fan of the early Crash games so I really hope they get this right, have to admit though when this was first announced I was under the impression that Sony were involved in developing it alongside Activision and had been hoping that Naughty Dog would be involved to some extent. Doesn't look like that's the case and given how shoddy the crash games have been since the PS1 I really hope they don't make a hash of it. I agree with KK, they need to absolutely nail the way it feels to control Crash. Cedar Gingercrystals wrote: I don't mind the art style, definitely better than most of what we've seen of Crash over the years and although the graphics are simplistic I think they look pretty good. I'm a big fan of the early Crash games so I really hope they get this right, have to admit though when this was first announced I was under the impression that Sony were involved in developing it alongside Activision and had been hoping that Naughty Dog would be involved to some extent. Doesn't look like that's the case and given how shoddy the crash games have been since the PS1 I really hope they don't make a hash of it. I agree with KK, they need to absolutely nail the way it feels to control Crash. The thing that makes me hopeful is the people working on it are fans of the early crash bandicoot games. It looks great actually, but whoever played this was a rubbish player. Crash 1 was incredibly hard though, and it also used the old method of having to collect tokens to save/get a code. Series got progressively easier, with 3 being relatively smooth sailing in comparison. KK wrote: Crash 1 was incredibly hard though, and it also used the old method of having to collect tokens to save/get a code. Series got progressively easier, with 3 being relatively smooth sailing in comparison. Yep, it was and I am sure the jump was different from Crash 2 & 3 as well. Because the first one, if you press the X button too hard and you will jump a bit further than usual. It was what made me impossible to finish it or getting 100% on every level. Crash 2 & 3 was so enjoyable to play and I wonder if they will include the secrets to get 105% in Crash 3. Ignoring the abomination of Crash himself, this was the look I had in my mind. It matches the darker and slightly grittier colour palette of the originals. i think it looks nice - but watching that trailer made me realise the original games have aged really well; they dont have too much of that awful 'developer's first 3d' look that a lot of ps1 games had. It was so common to see the seams of the world & environment stitched together in PSone games, and they'd always break up to some extent. I didn't have much love for this when I bought and played on release. Should have been left well alone.